In 2006, a group of local physicians in the area opened Southern New Mexico Surgery Center, an outpatient surgery center, to provide patients an alternative choice for surgical intervention. This group of physicians recognized that top quality one-day surgery can be delivered in a cost effective manner, away from a hospital setting in a modern, convenient facility. 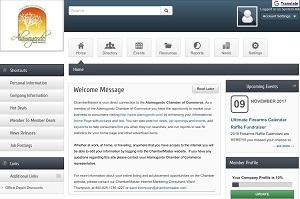 Local physicians are majority owners and are very active in the management and direction of the facility. 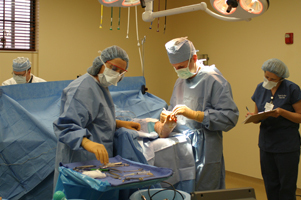 The facility encompasses 9500 square feet and utilizes three operating rooms. The services provided are: ENT, Pain Management, Orthopaedics, and Podiatry. The Center is licensed by the State of New Mexico as an Ambulatory Surgical Center, accredited by the Accreditation Association for Ambulatory Health Care (AAAHC), and certified by Medicare. Southern New Mexico Surgery Center, LLC will provide complete perioperative services for operative and other invasive procedures, including the immediate postoperative phase, to all patients without discrimination. The care provided is not limited to surgical intervention, but also embraces the psychological, social and spiritual dimensions of the patients and their families. This mission is fulfilled in collaboration with other ancillary and support services throughout the facility. To achieve and maintain this mission, a comprehensive patient assessment, reassessment and plan of perioperative patient care is consistently developed and implemented for all patients. 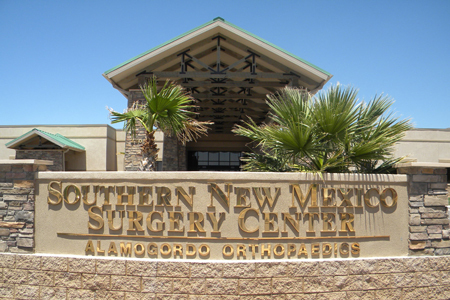 Southern New Mexico Surgery Center of Alamogordo, located in Otero County in south-central New Mexico, assumes certain responsibilities in the basic functions of the institution including service and teaching along with quality patient care.